Dimensions (with no keys): 3.5" x 0.5" x 0.25"
Weight: Less than 0.1 lb. This was a gift for my husband. He loves this product. He likes that his keys all fit in this compact holder. I unlock different doors on my job all day! And the keys look pretty much the same! Bought this,what a difference no bulk in my pocket,and organize! A bit fidgety putting keys on it and getting it together, but ultimately works great! Keeps keys in a nice tight package. 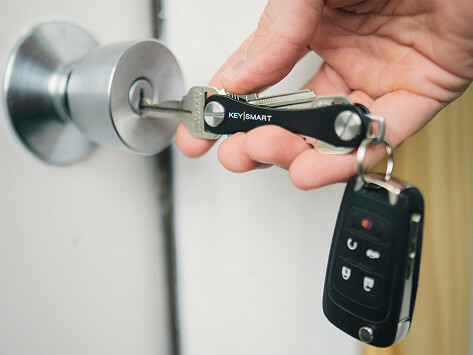 The creator of KeySmart, Michael Tunney, wants to change the way people think about carrying keys. Minimalist styling. Maximum functionality. That’s the idea behind this patented problem solver.